Its 5am and we just returned from a 21 hr climb of the Spectre via what we think is partly a new route. 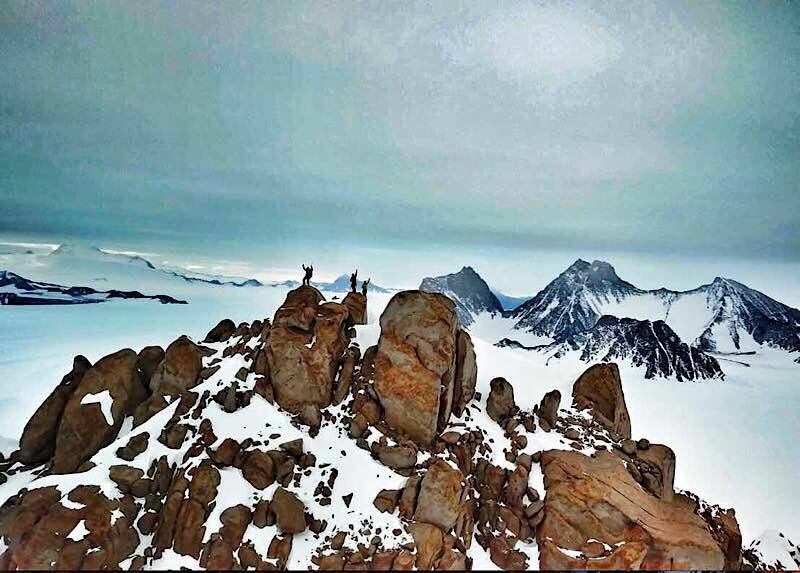 I haven’t had such a full on, mental and physical challenge like that since climbing a new route on the Balfour Face of Mt Tasman with Guy Cotter 15 years ago. We left base camp at 8am heading for the original route done on the Spectre almost 40 years ago. 2 hrs walking to the base of a 50 degree coulior. 2 hrs solo climbing up that saw us at the col left of the peak in the photo. We then headed up the rock with ice aces and crampons (lightweight touring ones). Immediately it became obvious route finding would be tough. Jean headed up into a steep granite chimney for an hour long battle. He was on the French alpine climbing team so is no slouch on such technical terrain. I tentatively followed. Twisting the axe into cracks in the rock, smearing the crampon points on small edges on the wall, wedging my body in the chimney, scraping and wiggling my torso up inch by inch. There was nothing stylish about my climbing; it was get up as fast as possible because there were 12-15 more similar pitches to go. By noon a cloud bank I’d seen on the horizon earlier was starting to push over. Peaks to the South were going under clouds. It looked like a storm was brewing. I got nervous and watched it intently. But it was mild, around -10c. Belays were cold, but bearable. We got higher and higher. Leo and Jean leading hard pitch, often poorly protected, after hard pitch. All extremely difficult and technical climbing. We were pretty sure we were not climbing the original line, but pushed on. At 11pm we made it to the summit. Elated, but still nervous about the weather. Man hugs, high fives, cheers and smiles. A quick drone flight to film our position, a GoPro interview for the film and some photos, then it was off to rappel the route. Only the last rappel rope got stuck. By 3am we’d carefully down climbed the couloir. Off the dangers, again happy; but tired, hungry, and thirsty. By 5 am we’d walked back to base camp. Glad the Spectre has allowed us safe passage to its summit and back. Today every bone in my body aches, every muscle hurts, but I’m stoked to have climbed the Spectre. Nothing is easy down here! Now the boys are looking at what to climb next…..
Jean and I have never climbed together before and I was impressed with his mixed climbing ability and safety conscious, yet determined approach. His pedigree is clear; well trained, well skilled, fit and experienced. Although there are a few cultural technique differences, solid partners are quickly recognisable and within a few rope lengths Jean and I felt comfortable as a roped lead team. Mark is super proficient and solid on glacial terrain. He spends hundreds of days a year on glaciers, in mountains, training Kiwi guides how to pull each other out of crevasses, assessing snow pack as chief heliski guide for one of NZ’s largest operators and generally being very safe in inherently unsafe places. It has been great to learn new tricks and skills from him (and Jean) in an area I am by far the least experienced. Removing the basket from your ski pole to probe for crevasses, attaching the rope coils to the side of your sack to get them out the way, stashing an ice axe under your pack shoulder strap for quick access in an emergency with the added benefit of making you look like He-Man / an Alpine Don. In the past Mark has climbed Yosemite Big walls, hard alpine summits and demanding trad routes. But by his own admission these days he is 90% skier, 10% climber and had no qualms with Jean and I leading and getting himself and his camera upwards by any means. 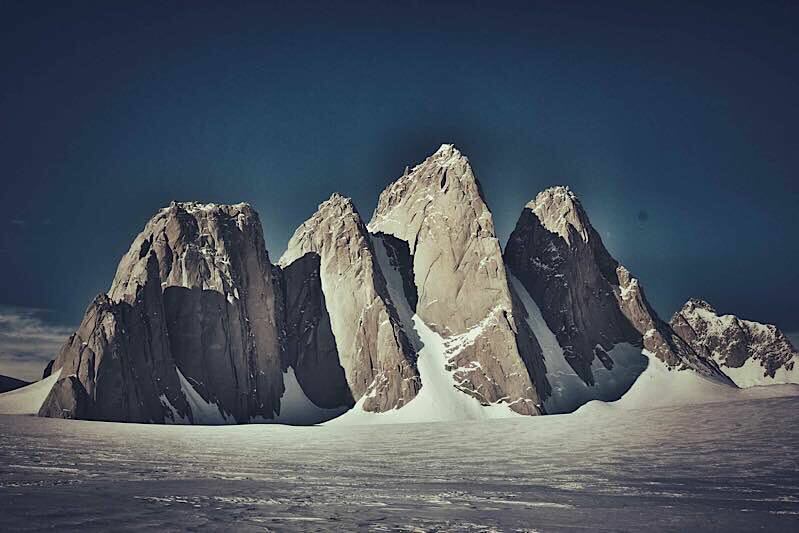 VOUS L’AVEZ FAIT, C’EST MAGNIFIQUE et surtout AUCUN regret pour la face sud , l’Antartique vous a accepté sur son sol parceque vous l’aimez , c’était votre rêve mais il ne faut pas trop en demander à cette grande dame. Nice one guys it certainly is a brill feeling when you have achieved and done something really good. Just like I did today, we went to the K village and I ended up with two new pairs of shoes. Not any shoes they are gore tex made by Clarkes shoes. Remember we braved the cold weather that we are having -3c driving in freezing rain and negotiating idiot drivers who won’t give way to you!!! Well written as always leo! Your expedition is already epic beyond belief! Hello, I just launched a site that follows expeditions and journeys in progress called ‘The Best Quest’. We are trying to increase exposure for people doing exciting and interesting journeys like yours. In the future we wish to also be a conduit for expeditions to achieve contributions. We would like to use your above photo with our logo as a social media banner to direct to our site. Do we have your permission to do so? I can show you the banner. Thank you!